Maybe it’s spring, maybe it’s St. Patrick’s Day, but green is on my mind. Yesterday’s post delved into the problem with green pea soups and how to evolve past the “Eeew!” factor. Garnishes are a godsend. Brighten pea green with some color and their appeal soars. Yesterday’s sweet pea soup was brightened up with roasted red and yellow peppers. 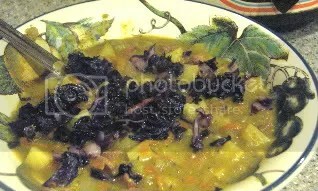 Here, split pea is paired with deep purple cabbage for a color combo that is actually quite lovely, especially for spring. Use color to eliminate the “Eeew” factor that so often accompanies pea soups. Here, frizzled purple cabbage creates an appealing color combo. In case you need a good split pea recipe, my basic follows. Diced potatoes, celery and carrots “thin” the intensity of the split peas, while adding some nice texture. More vegetable nutrition is another bonus. Make the soup as thick or thin as desired by using more or less broth. I personally don’t like mine thick enough to hold a spoon upright, so I use most of the broth called for. Bacon adds a characteristic flavor, but is definitely optional. In the past, I have used a combination of a little soy sauce, light miso and soy milk for a flavor substitute, but this is not necessary—just a fun idea to play with. A past blog explored what makes a recipe good for slow cooking. Split Pea Soup fits the bill perfectly. You can throw everything in the pot and forget about it all day. As you’ll see from this recipe, however, I use a 2-step process that works better with my schedule. I put the peas on to cook in the morning when I don’t have much time. The remaining ingredients get prepped and added at the end of the day. Another advantage of this process: the vegetables don’t get overcooked and the spices retain more of their flavor. No time for slow cooking? See the pressure cooker option at the end of the recipe. Stir sautéed vegetables into soup. (Don’t bother washing sauté pan; it will be used again for the cabbage.) Continue cooking soup over high heat until potatoes and split peas are very tender. If desired, add more vegetable broth if soup gets too thick. Just before serving, reheat sauté pan over medium high heat, add oil and when it is quite hot but not smoking, add cabbage. Sprinkle with salt and pepper, then cook, stirring fairly frequently, until cabbage just begins to soften and wilt. Remove from heat. Taste soup and add salt and pepper, to taste. Then serve in bowls, topped with red cabbage. Pressure Cooker Option: Lorna Sass, the master of pressure cooking, makes a similar recipe (but uses sweet potatoes and apples for something different.) She sautés the onion and celery in the slow cooker, throws in everything else and cooks at high pressure for 10 minutes. After a natural release period of 20 minutes, the soup is done—and just as tasty as cooking all day in the slow cooker. Great blog, Mary, and I really love your recipes! That’s a great tip on adding color to soups. I recently got a pressure cooker and it’s changed my life! They’re not at all like the ones we were brought up to be afraid of, and so efficient.